Those of you who have read #73 will remember that Chris and I have recently bought a house in the Clwydian Hills in North Wales, but on our recent trips over there we’ve been ‘flat-packing’ instead of ‘back-packing’ – IKEA has a lot to answer for! When the recent spell of good weather arrived it didn’t take much to find an excuse to escape, and as we will soon be living amongst the Bryniau Clwyd it seemed a good idea to keep it local. The Clwydian Range is quite obvious as you cross into North Wales from the end of the M56 Motorway – it’s the line of hills about twenty kilometres to the west, and on a good day it’s easy to identify Moel Famau (Hill of the Mothers), the highest of the Bryniau Clwyd at a height of 554 metres. 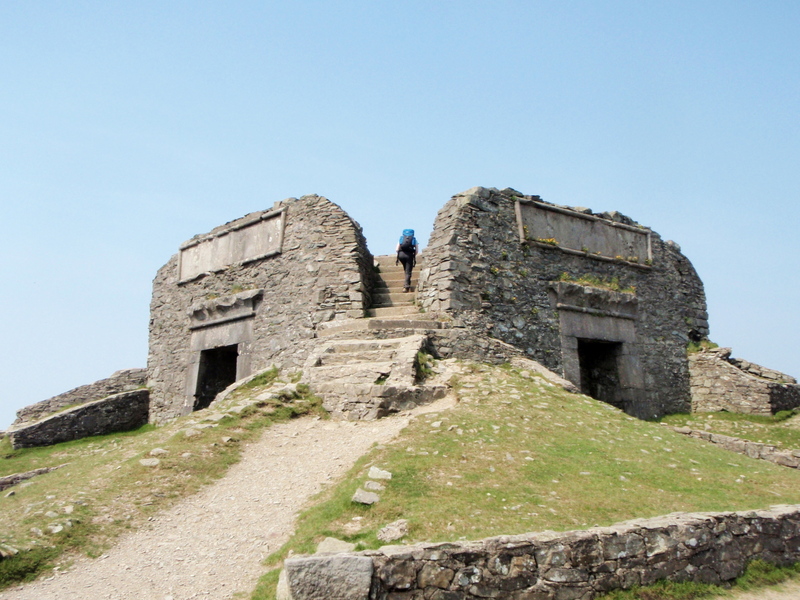 The summit is capped by the remains of a stone tower which can easily be picked out on a clear day. Our new house is at the northern end of the Bryniau Clwyd, tucked away under the slopes of the Iron Age hill fort of Moel Hiraddug (Hiraddug’s Bare Hill). 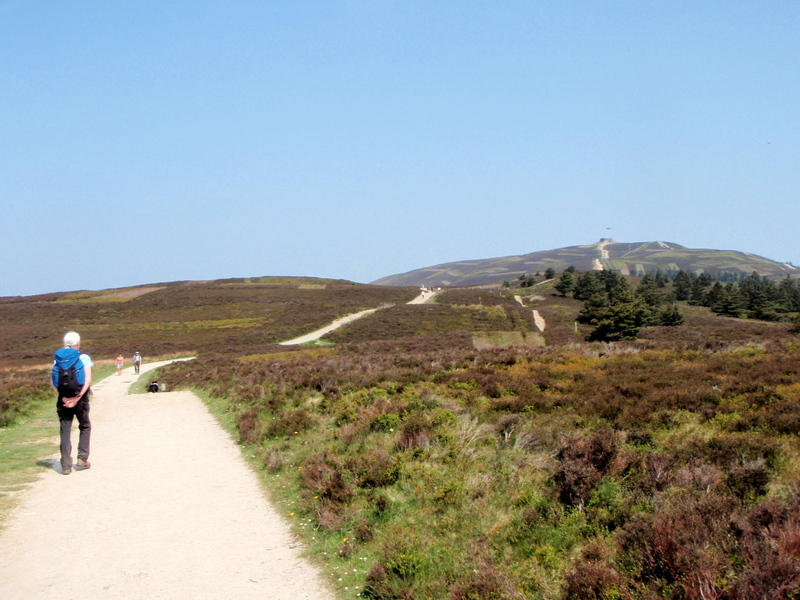 Although it’s only twenty kilometres (12½ miles) to Moel Famau as a Welsh crow flies, it takes about 45 minutes to drive the narrow lanes to Bwlch Barras, the place where most people set off to walk Moel Famau. 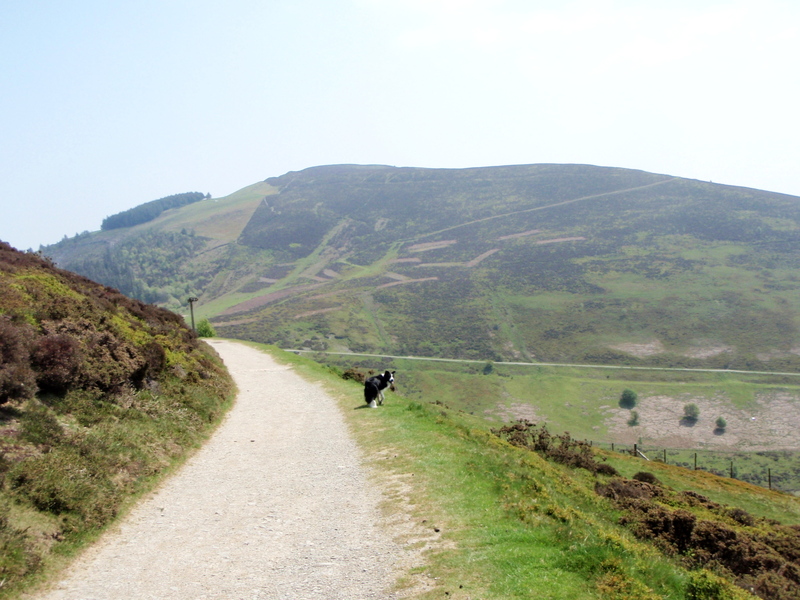 As walks go, the path to Moel Famau from the Bwlch (pass or gap) is an easy stroll, though we haven’t always found it so. The first time Chris and I came here with family, we were blown back to the car by a cold, bitter wind. On our last visit we had arrived at the summit to find the steps to the tower completely ice-bound – without spikes I had slithered to the top and back, whilst Chris had wisely turned down the opportunity. No ice today, though – the recent dry spell had left the ground parched, and for once our Border Collie ‘Mist’ was having difficulty finding water (BC’s could find a damp cloth in a desert, and probably get a drink out of it as well!”). 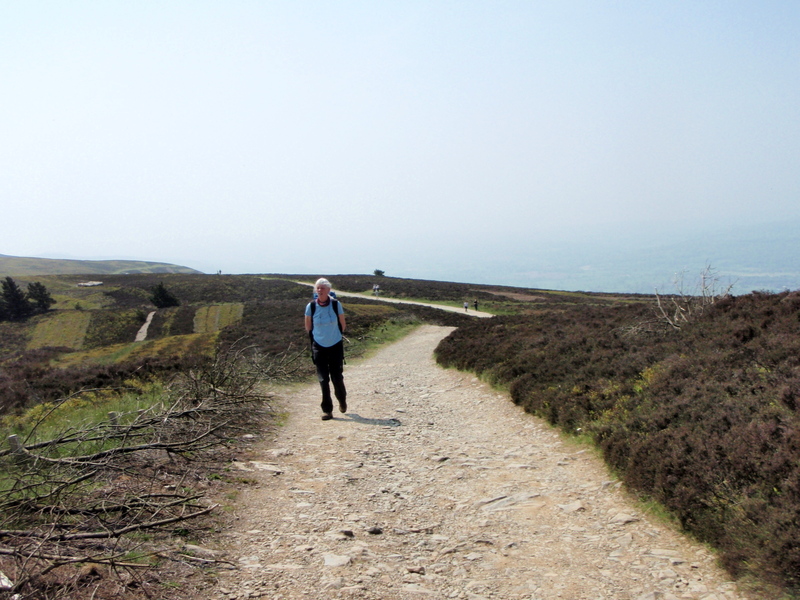 Further on we left the busier Offa’s Dyke Path to follow the eastern side of the ridge. The heat haze blurred the view into England, though behind to the south we had a good view of Foel Fenlli (Benlli’s Bare Hill). 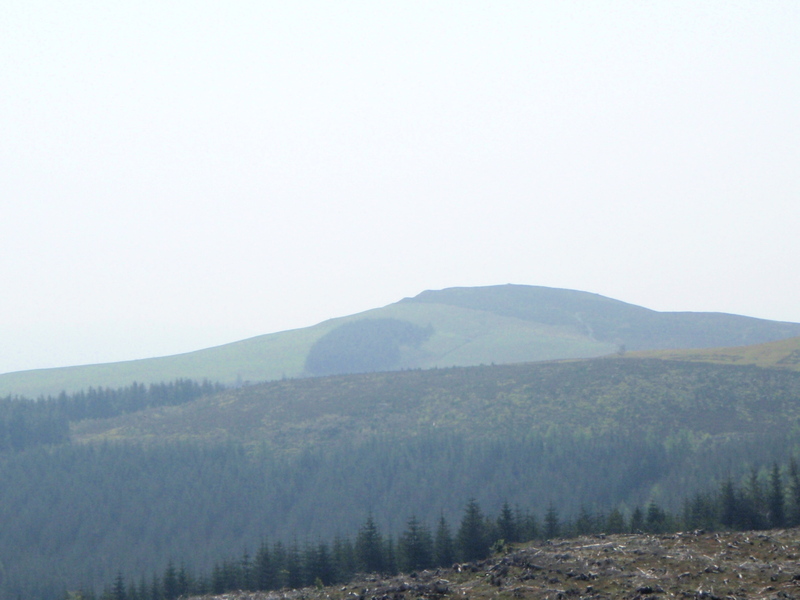 Foel Fenlli is an Iron Age hill fort about 2500 years old, one of a string of forts that ends at our Moel Hiraddug to the north. After the Roman occupation of Britain had ended, the locals continued to occupy the fort under King Benlli (about 450 AD). 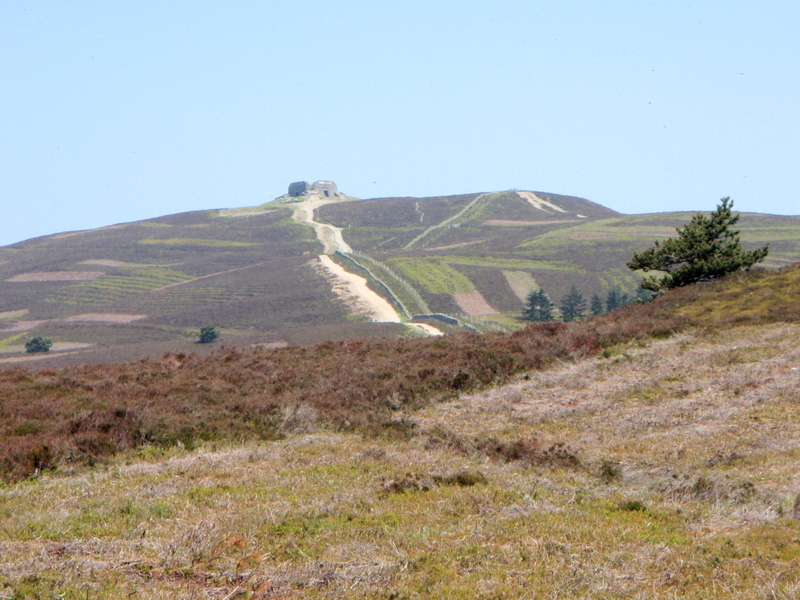 These small hills made superb natural defences, with steep slopes to deter aggressors – they make a pretty good job of deterring modern-day walkers as well. 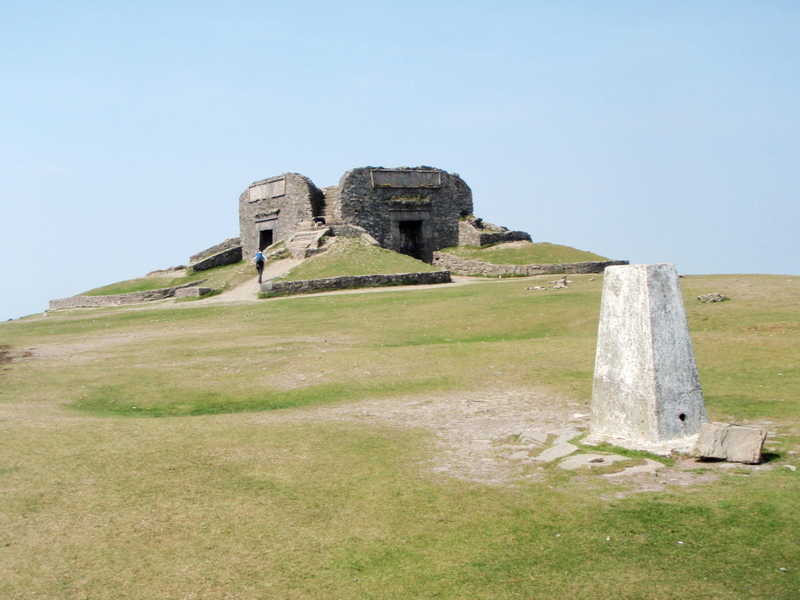 The summit has one of the ubiquitous surveyors’ triangulation columns (Trig Point) as well as the remains of the ‘Jubilee Tower’, built in 1810 to celebrate the Golden Jubilee of King George III. Unfortunately the money ran out before it was completed, and a storm in 1862 reduced the monument to its present height. 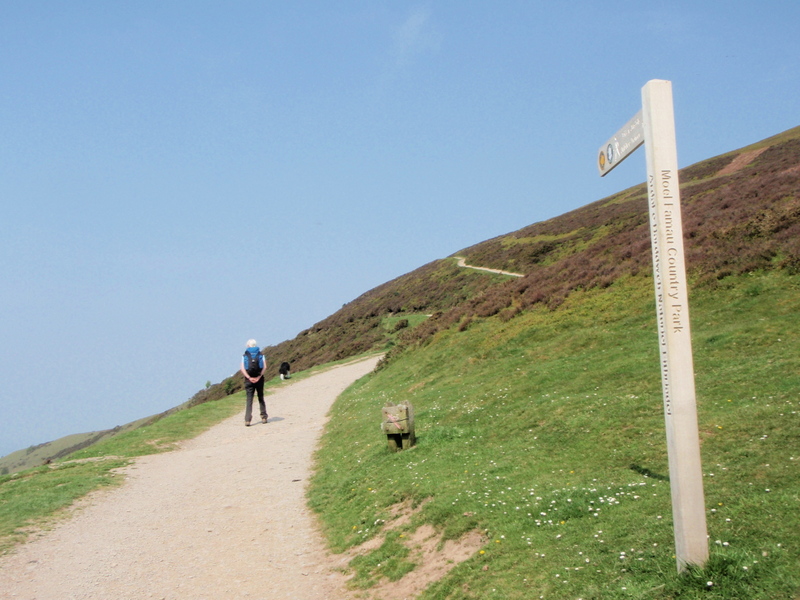 Moel Famau is more popular as a walking route now than at any previous time in its history, with the Offa’s Dyke and Clwydian Way Paths passing by the summit. 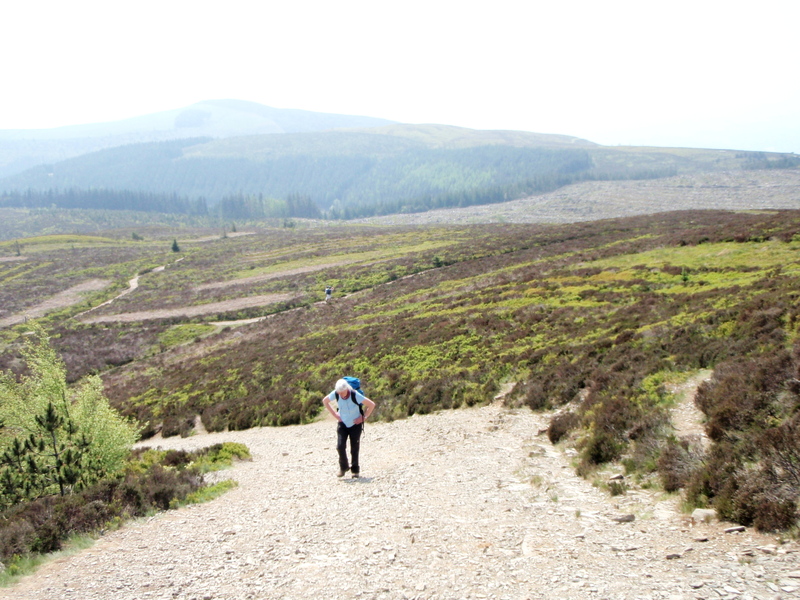 The warm weather had drawn out dozens of others, all enjoying the surprising warm spell, but the area remains much quieter than the ‘honey pot’ hills of Snowdonia, just down the road. A steady downhill walk took us back to the car, with the dog managing to find a pool of water deep enough to paddle in. A short drive back along the narrow lanes soon had us at the house to finish assembling the final bookcase. p.s. Whilst reading, why not practice a bit of Welsh pronunciation for fun! 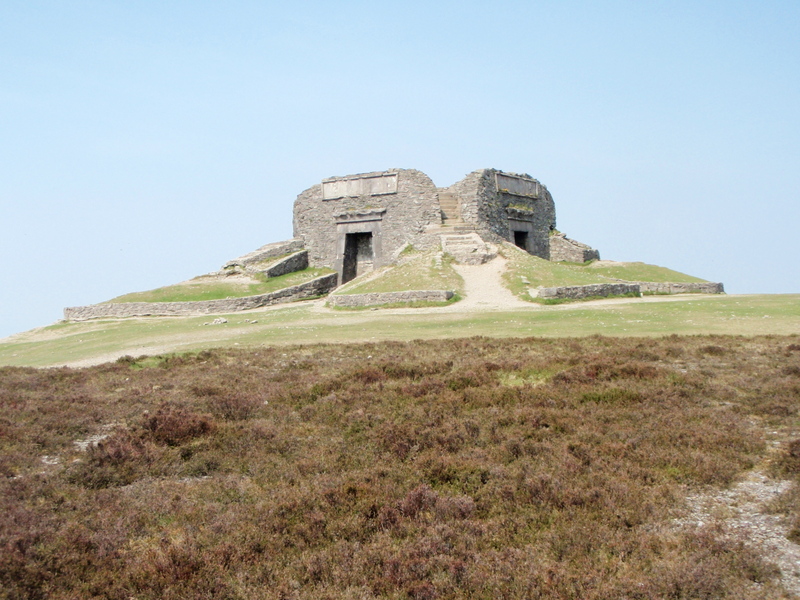 Moel Famau sounds something like ‘Moyle Vam-eye’, our local hill fort Moel Hiraddug is pronounced ‘Moyle Hi-ra-thigg’ and Foel Fenlli is ‘Voyle Venli’. 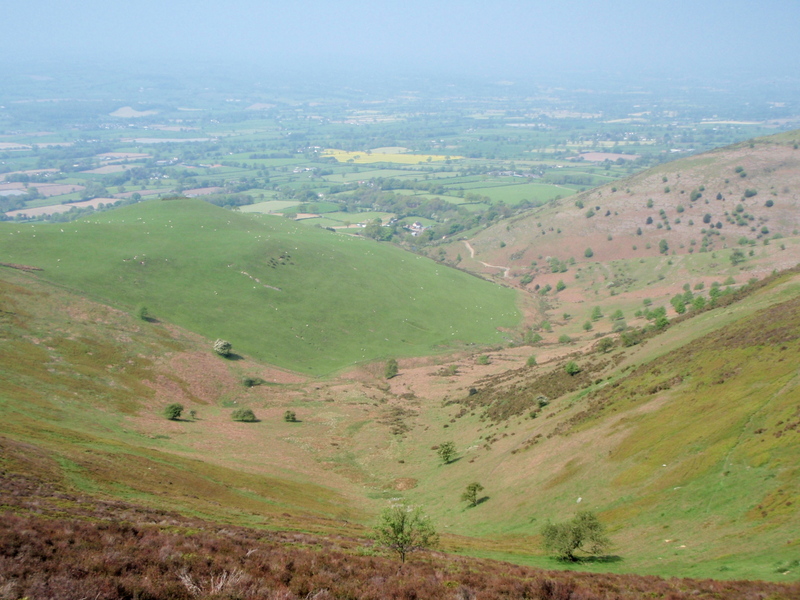 (Moel and Foel have the same meaning). There, wasn’t all that hard, was it?! This entry was posted in 5. 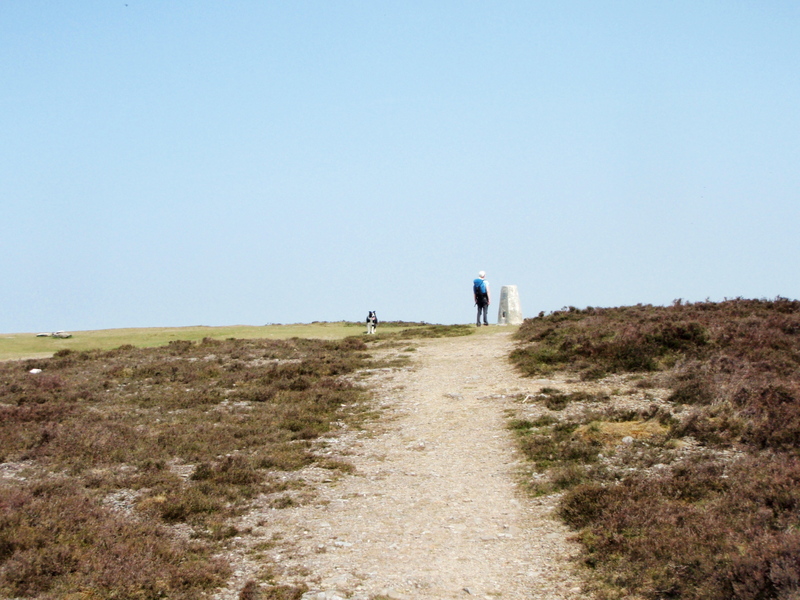 North Wales and tagged Clwydian Hills, hillwalking, mountains, photography. Bookmark the permalink. I work with the welsh contingent of wales and to try to annoy them by pronouncing their spelling as badly as possible, it works quite well :-). Are you going to the beacon fire for the jubilee now you are nearly an exile. I know nowt about the beacon fire though – where and when? Excellent article Paul, and lovely pictures. 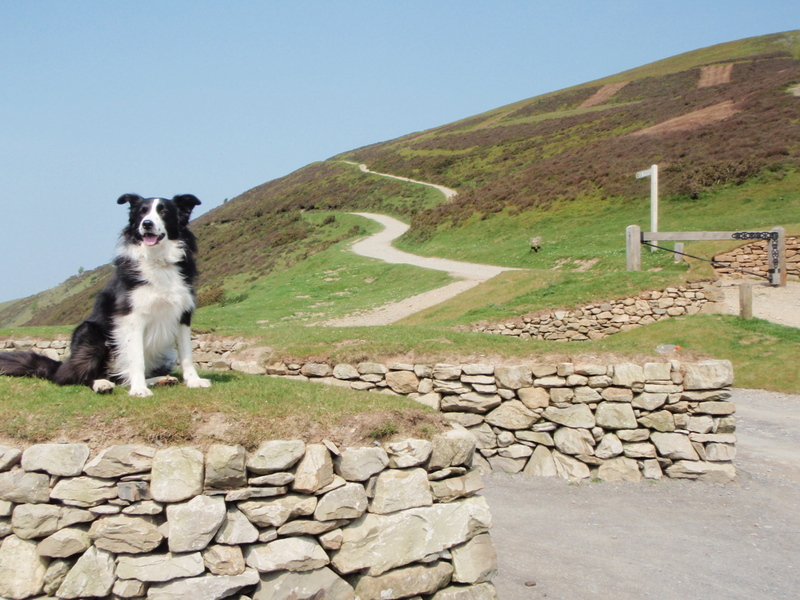 I go to N. Wales a couple of times a year – we usually stay at Criccieth – but unfortunately I don’t get out into the hills as much as I like as I have the family with me and ofter 2 or 3 grandkids. 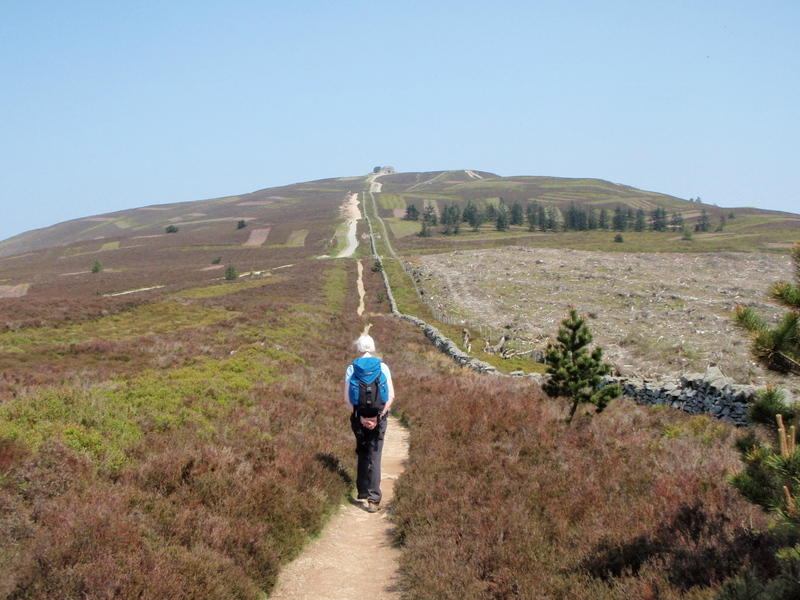 I must make amends and do some hill walking. Cheers SP. Have a look at post #37 (if you haven’t already) Lots to interest the family, and a real (if short) walk on real (if small) hills. 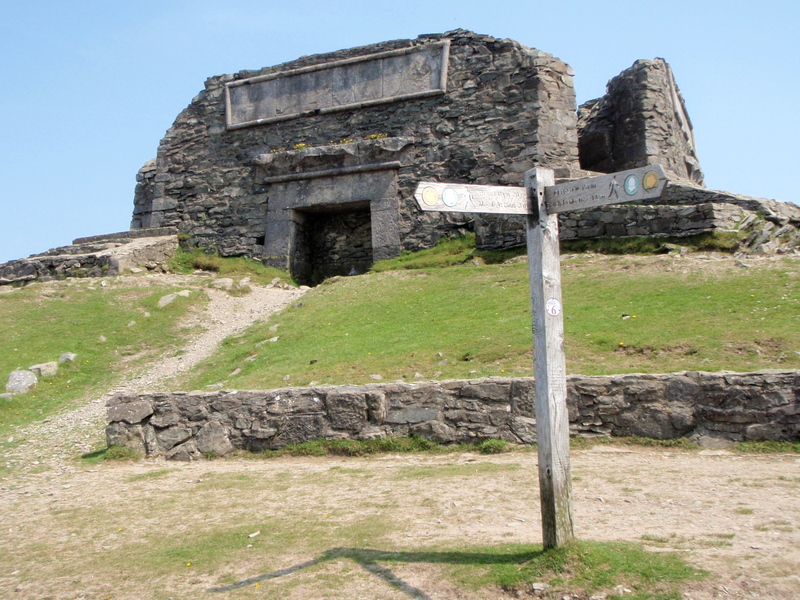 The start point is about half an hours drive from Criccieth. Glad to see that you managed to make the best of the weather. And a great write-up. With regards to the pronunciation are f’s always pronounced as v’s? Or just under certain circumstances? Thanks for that Lance. Had another great day yesterday (Lake District) that will appear as a post in a weeks time – unbelievably warm!! I’m a real beginner with Welsh, but parts of it are extremely simple and logical. All the letters have a sound (no silent consonants as in English or Gaelic). ‘F’ is always pronounced ‘v’, and if you want to say an English sounding ‘f’ it’s ‘ff’, as in ‘ffynnon’ (a well or spring). ‘C’ is always ‘k’, ‘d’ is ‘d’ but ‘dd’ is ‘th’, ‘u’ is ‘i’ (The town we English call Ruthin is pronounced ‘Rithin’ in Welsh). You will probably find a guide to pronunciation in Google. You followed the yellow (beige?) brick road! Interesting stuff Paul – more hills I don’t know. Your photos make it look really quite hot. This area is fairly new to me as well, though I’ve been driving through it for nearly 40 years! And, yes, it was hot! 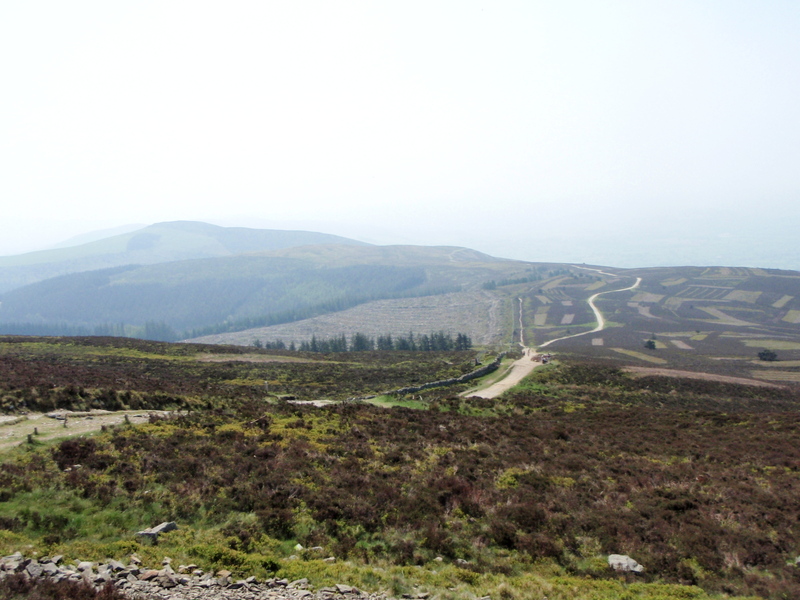 Think I worked out the other day that I’d been up Moel Famau over 50 times. It never gets old, I love the place! Gaelic is a nightmare IMHO – the rules seem to change just as you think it’s all weighed off! They will still be there next time you are in the UK – bring some hiking shoes!